Former Bills head coach and current St. Louis Rams defensive coordinator Gregg Williams issued the following statement on his former boss Ralph Wilson following his passing Tuesday. 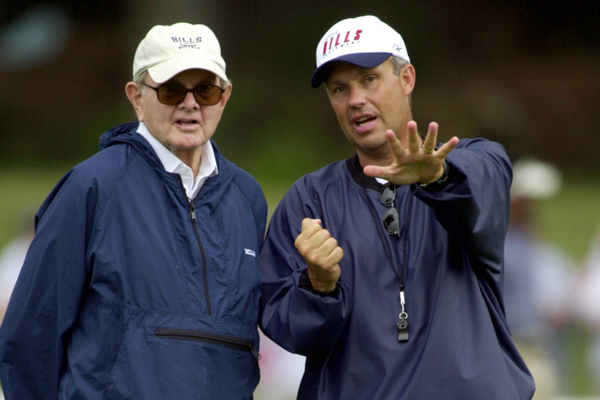 Williams’ first head coaching job in the NFL was under Wilson with the Bills in 2001. New England Patriots head coach Bill Belichick gave Jim Schwartz his first NFL job while he was head coach of the Cleveland Browns back in 1993. Schwartz had a jack-of-all-trades position that involved college and pro scouting while also being assigned with special projects by Belichick. The long time Patriots coach called Schwartz one of the most impressive young coaches he’s ever had working under him back in 2010 leading up to a game in which his Patriots were to square off against Schwartz’s Lions team. Schwartz impressed Belichick with his ability to multi-task and think creatively in that first non-paying job with the Browns. Belichick later helped Schwartz land an assistant job under Jeff Fisher with the Tennessee Titans back in 1999. A year later, Belichick wanted to hire him as an assistant for his New England staff, but Fisher wanted to hold onto Schwartz himself because he was expecting then defensive coordinator Gregg Williams to land the Bills head coaching job, which he did. Schwartz then succeeded Williams in Tennessee as defensive coordinator. According to SI.com’s Peter King in a conversation he had with current Saints defensive coordinator and former Bills head coach Gregg Williams, the Bills wanted Drew Brees way back in the 2001 draft. In his MMQB column he outlines a conversation he had with Williams. Naturally they were talking about Brees and Williams brought up Buffalo’s draft plans in 2001. As Williams tells it the Bills wanted Nate Clements in round 1 and obviously got him even though they traded down to pick 21 (from 14). In round 2 holding the 46th pick the Bills wanted to move up so they could take Drew Brees as their quarterback, but there were no takers and San Diego grabbed Brees at the top of the 2nd round with the 32nd pick. “I almost pulled a hamstring in the draft room, jumping up and down because I was so mad,” Williams told King. As King astutely points out, can you imagine how that would have changed Buffalo’s fortunes at the position? The following year they likely would not have traded for Drew Bledsoe. And as Williams told King. Former Bills head coach Gregg Williams is New Orleans’ new defensive coordinator. Head coach Sean Payton outlined how he came to hire Williams and the progress of their defense with the new scheme. “I had been in the NFC East for the better part of my career with New York for four years and Dallas for three years and even when I came to New Orleans that first year we played Washington so I was familiar with his defense,” Payton said. “It would always seem that regardless of his personnel they were one that tackled well that played with great fundamentals and gave you enough looks to cause problems. They were always challenging for us whether it was in Dallas or in New York or our first season here in New Orleans. Year one for a defensive coordinator is always a challenge especially when the scheme is a change from what was run previously. By the sound of Payton it doesn’t appear as though the Saints have all their ducks in a row yet on defense, which is good for the Bills offense. Williams has an intricate scheme and getting his players up to speed takes time as was the case when he was a head coach in Buffalo. Hopefully the Bills can take advantage of New Orleans’ inexperience within the scheme and keep pace with the Saints’ high-powered attack. Gregg Williams has finally chosen to coach the defense for the New Orleans Saints. The Bills former head coach was reportedly being pursued by Green Bay and was linked to the potential opening in Tennessee if current Titans DC Jim Schwartz gets a head coaching job elsewhere. Williams looks to be in a good spot. With a high octane offense, if New Orleans makes the right decisions in free agency and the draft with respect to their defense they could be in good shape. It also means for the third year in a row the Bills will face their former head coach. Green Bay and New Orleans are still hot on the trail of former Bills head coach Gregg Williams as they hope he’ll sign on as their defensive coordinator. According to the Green Bay Press-Gazette, Williams is biding his time in making a decision. Houston may also be interested and there’s a chance he could return to Tennessee. Williams parted ways with the Jaguars after just one season citing philosophical differences with head coach Jack Del Rio. With current Titans defensive coordinator Jim Schwartz having a second interview with the Detroit Lions today for their vacant head coaching position, it could lead to an additional opportunity for former Bills head coach Gregg Williams. It’s been widely speculated that if Schwartz lands the Lions job that Titans head coach Jeff Fisher would reach out to Williams to return as defensive coordinator. Williams has already interviewed for the New Orleans DC post. Gregg Williams a DC candidate in Green Bay? With Gregg Williams reportedly interviewing in New Orleans for the defensive coordinator job with the Saints, there’s a report that Williams is one of the top two candidates for the Packers defensive coordinator post as well. According to the Milwaukee Journal-Sentinel, Williams is a legitimate candidate even though the Packers have yet to begin interviews. Jim Haslett is also reportedly a candidate for the job as he had Packers head coach Mike McCarthy on his New Orleans staff as his offensive coordinator. Former Bills head coach Gregg Williams is interviewing today with Saints head coach Sean Payton for their vacant defensive coordinator position. Williams is not being retained by the Jaguars as his contract is expiring. Jacksonville ranked 17th overall in defense this season and 13th against the run despite a myriad of injuries and a brief fallout between head coach Jack Del Rio and MLB Mike Peterson. Apparently it wasn’t Williams plan to stay very long. He was hired by Del Rio, but operated under the final year of his original contract that he signed in Washington, with Dan Snyder reportedly paying most of his salary this year. Weird arrangement. Anyhow, it’ll be interesting to see what he can do with the Saints defense in a very competitive NFC South if he gets the job. He’d also face his former team the Bills for the third straight season if Payton hires him.